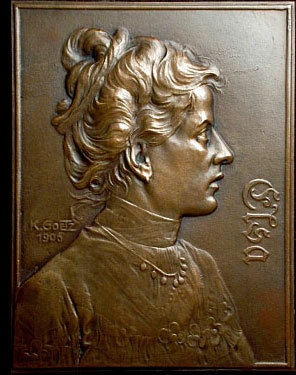 When Goetz arrived in Munich he found that the art of the medal was not very popular there, yet he was determined to work in that field exclusively. His former teacher, master engraver Dominal, advised him to buy the company of the late court engraver Max Gube from his widow. The most valuable asset of this acquisition was the customer list and in fact he realized some revenue from it when old customers ordered coat-of-arms designs cut into steel for personal seals. This led also to an order for a seal from the German Museum, K-652. The first commission in Munich came from the brewery family of Pschorr, who sponsored a medal to commemorate the erection of the Emperor Ludwig monument (K-1). Some of these medals were also sold to collectors and museums. The positive reception of his opus number one gave Goetz courage and confidence to continue his efforts. The beginning was hard but slowly he made the right connections. Of great help was his joining the Bavarian Numismatic Society in 1905. It's president was Excellency von Frauendorfer, a connoisseur of medal art; he made it a habit to show Goetz's creations to the members at the monthly meetings. Some new orders came Goetz's way from such publicity. One of the orders was for the bakery exhibition medal (K-22). Goetz was granted a sitting by Prince Ludwig of Bavaria to model him. This then lead to a relationship with the Bavarian Mint, a connection which proved very fruitful for Goetz and lasted almost to the end of his working life.1 Herr von Riederer, the Royal treasurer and president of the mint thought very highly of Karl Goetz and favored him over the years with numerous commissions. In 1912 Goetz became a member of the Munich Artist's Society and participated in the annual exhibits in the Glaspalast (Glass Palace).